1. Preheat the oven to 200°C, gas mark 6. Mix together the frozen fruit, cinnamon and half the sugar, then tip into a large ovenproof dish. Bake for 15 minutes until the fruit has begun to soften. 2. Meanwhile, make the crumble topping. Place the ﬂour, oats and a pinch of salt in a large bowl; stir together. Using your ﬁngertips, rub the butter into the ﬂour and oats until the mixture resembles coarse breadcrumbs. Stir in the nuts and remaining sugar. 3. Gently stir the softened fruit, then smooth down with the back of a spoon. Top with the crumble, return to the oven and bake for 30 minutes until golden. Cool for 5 minutes before serving with double cream, ice cream or our easy white chocolate custard, right. 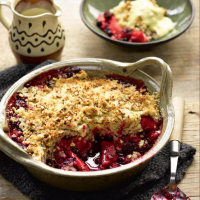 Soak 150g raisins in 4 tbsp brandy while the fruit is cooking, then stir into the apples and berries before topping with the crumble, made with wholemeal instead of plain ﬂour and hazelnuts instead of pecans. Instead of apples and berries, use 4 essential Waitrose pears, peeled, cored and cut into large chunks, and 400g essential Waitrose frozen blueberries.